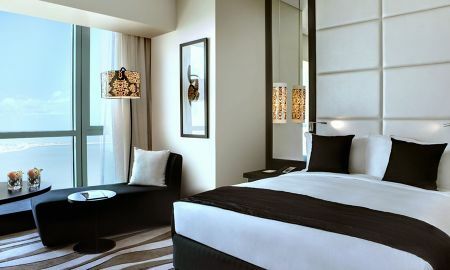 The Sofitel Abu Dhabi Corniche is a towering 5-star luxury hotel of 280 rooms in the style of pan-Arabic nations blended with the modern chic of France. This remarkable hotel was designed by London WA International and its atmosphere suggests a style of French “art de recevoir” with interiors inspired by Pierre Soulages. Guests are invited to discover local treasures whether they are traveling on business or leisure. Savor the hotel’s cuisine with its unique variety of restaurants and bars, serving French pastries, fresh Gulf seafood, traditional dishes and fine French gastronomy infused with Middle Eastern flavors. Taste lovely post-work cocktails while conversing with colleagues with relaxing jazz music. The So SPA is the perfect place to unwind and relax your mind and body with a dip into the hotel’s pools. 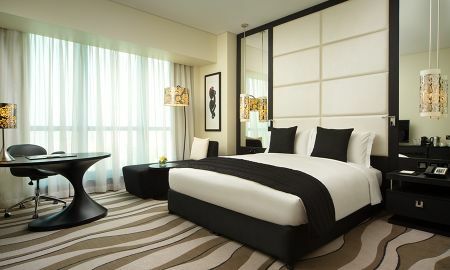 At the So FIT, maintain your healthy lifestyle before relaxing into hotel’s special bed concept, MyBed. Host events and meetings in the hotel’s glittering conference rooms. 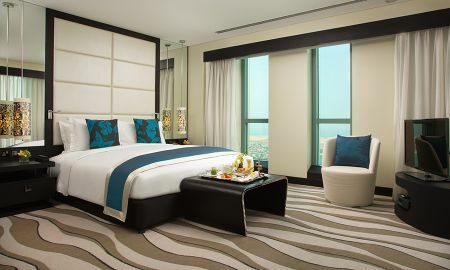 Abu Dhabi is one of the U.A.E’s most frequented and well-loved destinations. With its international business opportunities, stunning array of attractions, and phenomenal shopping opportunities, guests have been experiencing its allure for years. Port Zayed boasts a stunning array of famous rugs. Visit Sheikh Zayed’s Grand Mosque, one of the largest in the world, is just one of the many sights the city has to offer.